We all have a long wait for a new Star Wars movie to come out, which isn't until Rogue One: A Star Wars Story arrives in December. Fortunately for us, there is a lot of great expanded universe stuff to enjoy in the meantime, and one of the most exciting bits of that has been Star Wars Rebels on Disney XD. Season 3 is coming this fall, and we just got a brand new, revelatory trailer and poster for the upcoming new episodes. The trailer arrived during the Star Wars Rebels season 3 panel at Star Wars Celebration, which is currently taking place in London. Fortunately for us, Disney and Lucasfilm didn't make us all wait to be able to see it, as they uploaded it to their YouTube channel shortly after. This was not just some tiny tease of a trailer either. It clocks in at 3:32, and it is extremely action packed and has some massive reveals for next season. Disney also decided to release the new poster for the upcoming run, which also teases some of what is ahead for the Ghost crew next season. Season 2 left us all on a bit of a cliffhanger in regards to Asoka and the outcome of her battle with Darth Vader, and the trailer opens with the echoes of that. We don't get an answer as to what exactly her fate is, but the trailer moves right into teasing what is ahead for the crew of the Ghost next season. As it turns out, there is a lot of big stuff coming. We get to see that Ezra is furthering his struggle as a young apprentice, and is having a bit more of a pull to the dark side. Kanan is still dealing with being blinded by Darth Maul, but seems to be settling in and becoming a bit more wisdomful. There is also a whole lot of Mandalorian action, Wedge Antilles shows up in a very unexpected way and the big reveal is that Grand Admiral Thrawn is going to be a villain in season 3 of Rebels. For those who may not know, Thrawn is one of the biggest villains in all of Star Wars history, even though he has never made an appearance in the movies. The character first appeared in the Heir to the Empire book trilogy in the early 90s, which is credited with reinvigorating fan interest in the franchise at the time. So he should prove to be a massive threat for Kanan and the gang next season. Star Wars Rebels follows the crew of the Ghost starship who do what they can to stand up against the Empire, and do their part in the early years of the formation of the Rebel Alliance. For those who need to get caught up, Rebels season 2 comes out on Blu-ray on August 30. 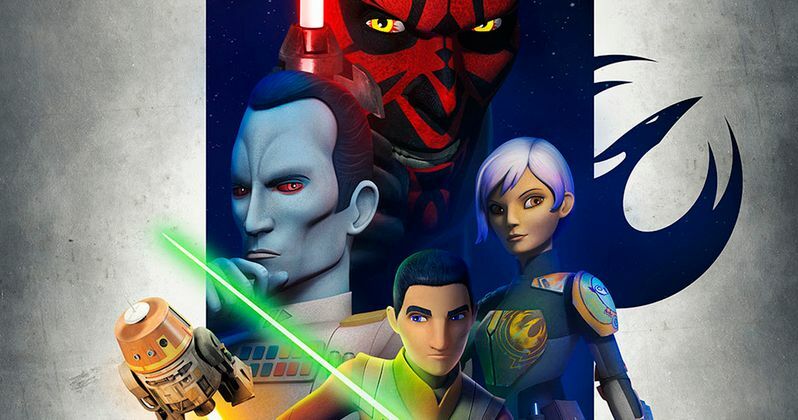 Star Wars Rebels Season 3 makes its debut this fall on Disney XD. Be sure to watch the trailer and check out the new poster for yourself below. Is Benicio Del Toro Playing This Star Wars Rebels Character in Last Jedi?